One of the common questions that we get at Concrete Camouflage is "Can you stain old concrete?". 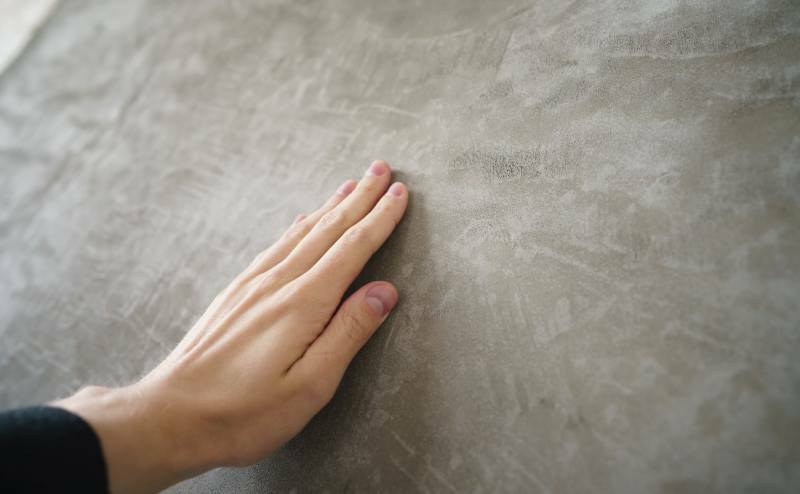 People are often concerned about whether the age of the concrete prevents it from being acid stained and if they need to turn to using acrylics to "stain" their old concrete. The answer is: yes, you can acid stain old concrete. The process for acid staining old concrete is not all that different from staining new concrete with a few exceptions. Below, we will walk you through how to stain old concrete and the differences from how to stain new concrete. It's best to stay away from acrylics. Many stores will suggest using an acrylic stain to work with older concrete. But, all acrylics "stains" are, is disguised paint. With time, they will peel up and look terrible and end up costing you more effort and money in the long run. True concrete stain is to concrete like wood stain is to wood. 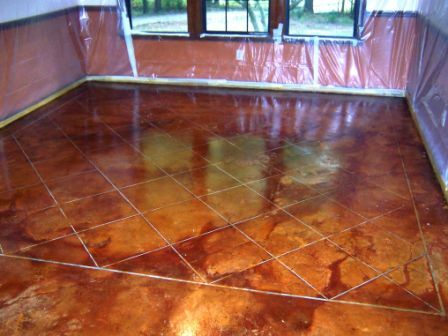 Acid staining is a chemical reaction that permanently changes the color of the concrete surface. 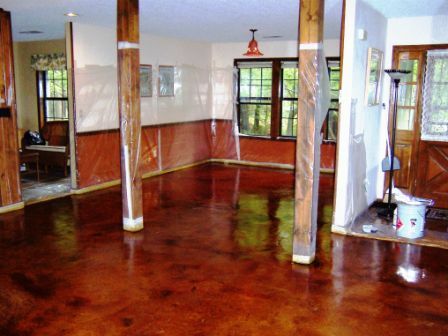 If you want to stain old concrete, using a true acid stain is always the best option. Avoid "acrylic stains" as these are disguised paint and will also peel with time. Concrete Acid Stains are the only true stains with permanent results. Your existing old concrete should be fine to stain, so long as it is not contaminated with glue, paint, oil, grease, sealers, waxes, or anything else that would prevent the stain from soaking into the pores of the concrete. The simplest way to test to see if your old concrete is sealed is by pouring a little water onto the concrete. If the water soaks in, then you are good to start prepping for staining. If water beads up or sits on top of the concrete, you will need to strip the sealer from the concrete before you can start staining. For the other contaminants listed above, just take a look at the concrete itself. Even if you do not have any contaminants on the concrete, you will need to clean the concrete well before staining. However, different contaminants on the concrete require different tools and methods to deal with, so we have outlined what to do. You'll need to remove the sealer before staining. To remove concrete sealer pour on Xylene (also known as Xylol or Touline) onto the concrete and let sit for 30 seconds or so, then scrub with a stiff straw brush. Then use a painter's shield to scrape the sealer into a pile and remove with a square point shovel. Then pour a little more Xylene on and repeat. If you're staining old concrete outside, such as staining an old concrete patio, you can power wash the sealer off of the edge of the concrete. If the concrete floor has wax, you will need a floor wax remover. You want to apply the floor wax remover to the old concrete, let it sit for a while, and scrub with a soft bristle brush. Mop up the area as you go until the floor wax is completely removed. Note: if you need to remove both wax and sealer, then there's no need to strip the wax and then the sealer, as the Xylene will melt and remove both at the same time. You'll need to remove these with a paint stripper, mastic remover or heavy duty glue remover. With paints and glues you will still likely need to lightly sand the concrete. Which you can do with a rented floor sander or floor buffing machine with the sanding pads. 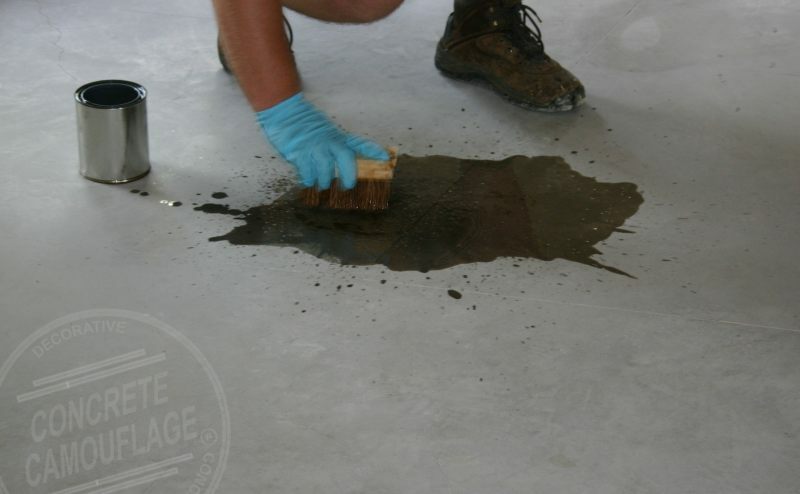 If you have grease or oil on the floor, you will need to use a degreaser or stain prep for concrete floors. Since the concrete is old and you may not know for sure if any type of oils, grease and thin petroleum products have ever been spilled on the concrete, we suggest degreasing the concrete regardless. 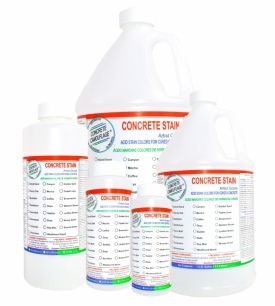 We suggest using our Concrete Stain Prep because it's not only a degreaser but also a natural solvent that helps to deep clean and lift oily petroleum contaminants up and out of the concrete pores. Apply the stain prep and let it sit for 5 minutes (30 minutes if you are removing heavy areas of grease, oils or tire marks) and then scrub the area with a stiff straw brush or a rented floor buffing machine with the aggressive scrubbing/stripping pads. Give the area a final clean with T.S.P. and rinse well a couple of times with clean water. 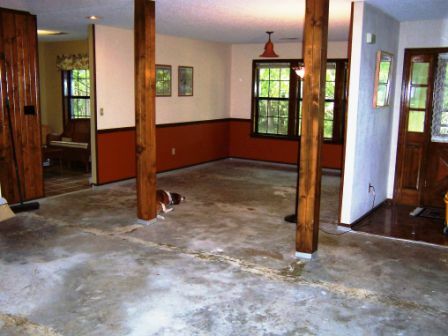 After your floor is completely dry, you are ready to move on to the next step: staining concrete. Use a small test area before staining all of the concrete. You want to pick an out of the way area, such as a closet if you are staining an old concrete basement floor. 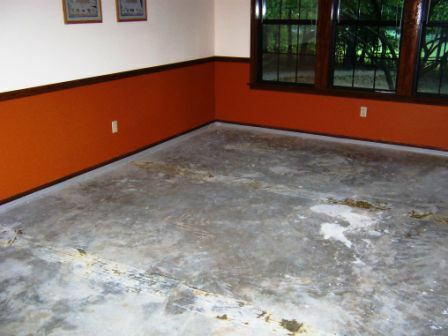 You want to acid stain just a few square inches of concrete and see what the result is. The reason that you want to test older concrete is three fold: to ensure that the concrete is properly stripped and cleaned, that the concrete stain will react properly, and that you like the color. We offer all of our stains in sample sizes for this part of the process. If your concrete stain did not react properly, it could be because many of the big box concrete stains might not be up to the task, especially if the concrete has ever been acid washed or acid etched. Which is why we suggest using our Artist Grade concrete stain on older concrete. Acid staining old concrete is the same as staining new concrete with a few caveats. The process is still the same: clean and prep your old concrete as outlined above, apply the stain, let sit the appropriate amount of time, then neutralize. 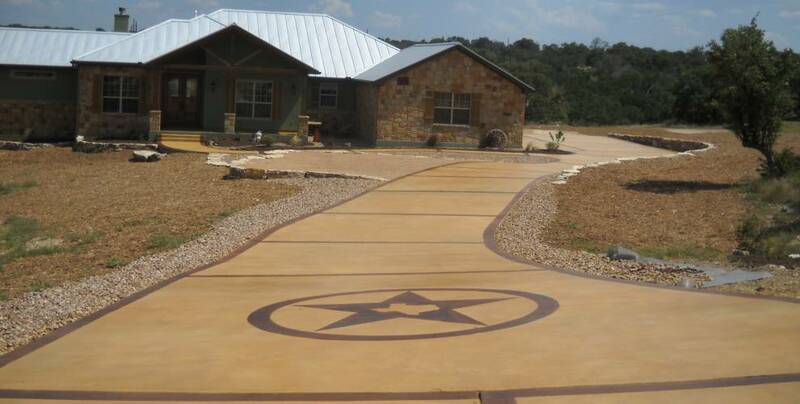 If you're staining stamped concrete, the process is the same. Older concrete does, of course, have a harder time accepting and reacting to concrete stains and sometimes older concrete has become more worn and weathered. This is especially the case if you are staining old concrete outside. All of this causes the concrete to soak up more stain. So, you'll want to order a little extra to ensure that you get a good saturating coat. Depending on how old, rough and porous the concrete is, the coverage of the stain can be reduced by as much as 20% to 50% or more. While you do not strictly need to seal your acid stained concrete, we strongly suggest doing so. Applying sealer will help maintain the appearance of your stained concrete. You can apply sealer once the stain has been neutralized, rinsed well and the surface is completely dry. We suggest using water based sealer rather than solvent based. Pour the concrete sealer into a paint pan and apply using a ¼'' to ⅜'' nap roller. You want to apply water base sealer in as thin and even of coats as you can. Apply one coat working north to south, allow it to dry completely clear, and then apply a second coat east to west. If your concrete still has a patchy or dry appearance, you can apply additional coats to smooth it out. 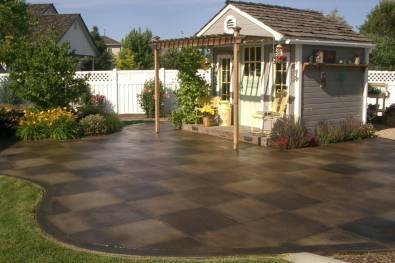 You do not want to over-apply the concrete sealer or you will get a cloudy or milky look to the finish. Once the sealer has cured for a day or two, for concrete floors and many outdoor surfaces as well, you're ready to apply the floor wax. There's really no reason to be afraid to stain that old concrete. Just be sure and do a small test spot first to be sure of what you're going to get, and if you have any questions about any step in the process or just questions about concrete acid staining in general, feel free to shoot us a message. We're happy to help! Our full concrete staining index includes maintenance tips, scheduling guide, checklists, color charts and much more.